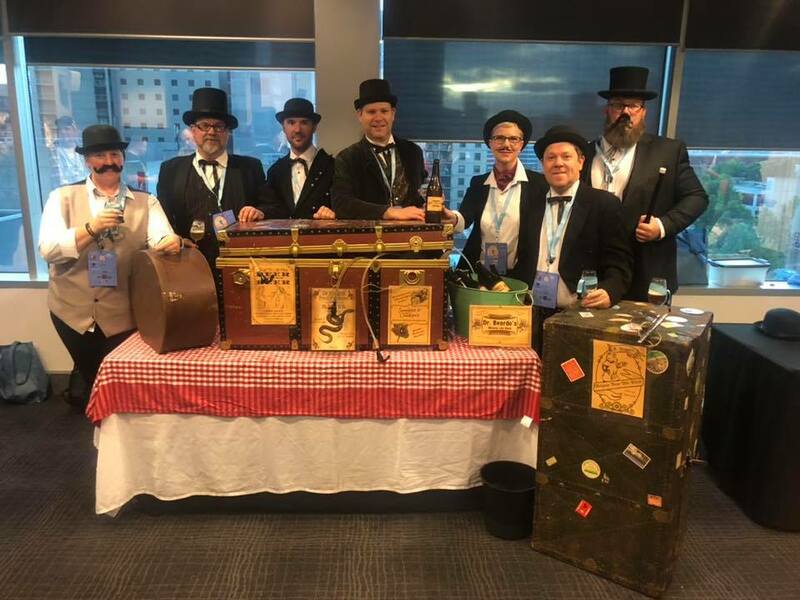 Congratulations to all our members who placed at the Australian National Homebrew Championships judged late last week in parallel with the Australian National Homebrew Conference. Overall SA placed third in the state rankings with 11 winning beers (not all SABC members) — which is an excellent result showing we punch well above our weight compared to the numbers from the bigger states (that have more than one club). SABC members Greg Weider (three silver) and Kieren Vercoe (two gold, seven places) were both placed second as best brewer but it was Greg who took it out on a countback. The full results are here. Along with great wins by Greg and Kieren, other club members with places were: Clinton Fisher (x2), Michael Handran-Smith (two silvers), Wolfgang Trenkler, Adrian ‘Wol’ Reich (x2), John van der Zalm, Matthew Kennedy (a 3rd), Neill Gardner, Joel Gaskin, James Edwards, Gary Waters, Stuart Kirk (x2, including a silver) and Paul Reck. With those wins, SABC won joint best Club at ANHC Clubnight with our ‘snake oil salesmen’ themed bar. Gary’s Saison won third place in the Hopco Southern Cross hop challenge. The prize was a piece of shiny SS Brewtech that we’re going to work out how the club members can use it. Overall the National champs and ANHC conference was a huge success for us. A big thank you to everyone who won a place, attended the conference and dressed up or brewed for Club Night but especially Gary Waters and his wife Lee who not only dreamt up our theme, they also sourced the props (thanks Pirate), helped all of us find our costumes (thanks Priddo) but also brewed two excellent beers, drove our kegs and props over with Kieren. It all came together so well and topped off by Sam’s great labels. Finally, to acknowledge that Mike Leupold awarded John Preston Award for his running SABSOSA over the last 20+ years. This is a prize awarded at the Australian National Homebrewing Conference recognising his outstanding contribution to Australian home brewing. Mike was in Melbourne to accept his award even though he didn’t know he was getting it. Congratulations! The Aust Nat Homebrew Conference is on October in Melbourne and the website and program are now up. Our events co-ord Lachlan is starting to get a clearer picture of who is going and how they’re getting there to see if there are some ideas for car-pooling and transporting kegs over. The club is taking part in Club Night, a great event to get together and meet other brewers and show off our beers. This year’s theme is All Things British India, so think the Raj but IPAs of course. ANHC are also putting on a hop challenge. We don’t know what the hops are yet but when we do and they land we’ll offer them to a club member(s) who want to take on the challenge. Check out the post on our Facebook group or send Lachlan an email at Events@sabrew.com. Tickets are on sale now at early bird prices. Over the last 10 years the conference has grown in leaps and bounds, providing a forum for amateur brewers from all over the country to come together and gain wisdom from some of the best and brightest minds the beer world has to offer. This year’s speakers will include Drew Beechum from “Experimental brews”, Jay Goodwin from “The Rare Barrel”, Denny Conn from “Homebrew Allstars” and many more, all keen to share their knowledge and expertise. There will obviously also be the social events: the AABC Awards presentation, The 2018 pairing dinner, Brewery tour and of course, the notorious club night! With a couple of weekends’ work from a few of our members, we have a pretty nifty bar, in the shape of a small dinghy, ready to go for Club Night. What we are missing is a bit of set dressing to take our Pirates with Paddles theme to the next level. If you have any marine paraphernalia that you are willing to lend the club for an evening, please get in touch with Gary on 0417 893 321. We’re thinking tea chests, anchors, buoys, nets or anything that you think would fit the theme. And don’t be afraid to get out that old pirate costume you’ve got stashed in the back of the wardrobe. Stuffed parrots not mandatory but preferred. Think of it as a practise run for the Pirate Life event later in the year. Club Night Brewers, We Need You! We think we may still need a few more brewers for ANHC Club Night, but it’s really hard to tell IF WE DON’T KNOW WHO IS BREWING! PLEASE, if you are brewing or can brew for Club Night, can you take one minute (that’s all it will take) to fill out the on-line form here. The information that you provide will make planning easier for those people trying to pull this event together. As mentioned at the meeting this week, we also need some more people to put their hand up to brew for the event, so if you have a keg to spare or the time to brew one in time for mid-October, or if you can help with the build on the 3rd, please let us know. We are still looking for a few handy people to help out with the conversion of Gary’s dingy into the winning bar at the ANHC club night. At the moment working days have been scheduled for Saturday 13th of August and Saturday 20th of August. If you think you can spare some time, please contact Gary on 0417 893 321. We also need dispense gear (which will all go back to its owners), so if you have fittings, disconnects or anything else useful please let us know. We have a need for hands-on folk to undertake the construction of HMAS “Soon To Be Named” for the ANHC club night. We are converting a wooden row boat into a super-bar, with taps, cask and hand pump, and hopefully even a hoppinator. Creative types who can think of a theme and appropriate dress code for the evening. Brewers – we need to serve kegged beer. The theme I am sure will be released by the ANHC committee soon. Construction crew and a venue to house a 3 metre x 2 metre wooden boat and hand trolley. Kegging equipment suppliers/ fibreglass or insulation specialists. Cask crew needed. 1-2 casks, appropriate brews and a hand pump arrangement. Transport crew – Ed has volunteered his van but the boat just won’t jump in like Porter the dog does. Thirsty people .. We just can’t go with a dry run can we? There is 5 weeks until the AGM it would be great to most of the construction done by then and an unofficial launch shortly after. As the local club this year, we have no excuses not to pull off something amazing, so even if you can only spare an afternoon, if you have some time and skills to offer please step up.